A group of business and company sales specialists across business transfer, business brokerage and corporate finance, serving owners across the UK in the small cap marketplace. AGM Statement – A strong start to the year in-line with management expectations. Expecting substantial profit growth in FY18. Apart from the 6% Spread I quite like the look of this. Trading Update – Expects “Interim Results will demonstrate a continuation of the Group’s strong performance across all three divisions with significant uplifts from the comparable prior year period”. Expecting to report record revenue of approximately £7.5m, a LFL increase of 34 per cent and EBITDA of approximately £3.3m, a LFL increase of 27 per cent – Comfortably in line with market expectations for the full year ending 31 May 2018. Quite like the look of this, it looks good value here. It’s still on my Watchlist (but I hate EBITDA, why can’t the tell us the real PBT – Arggghhhhh!) until I see the actual results. Interim Results For The 6 Months To End November 2017 – A strong H1. Revenue up 34% to £7.5m (£5.6m last time), EBITDA up 28%, EPS up 32% (6.14p) and the Dividend is up 217%. Momentum has continued into H2. Trading comfortably in line with management’s expectations. I quite like this and it’s going on my Watchlist, 145p. Trading Update – Significant Year on Year growth already. Expects full-year revenue to be circa £16m, and EBITDA to be circa £7m. 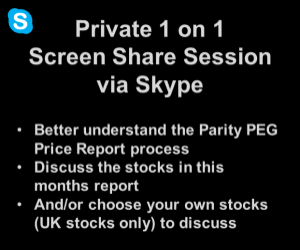 Remains on my Watchlist at 145p although I reckon I will have to revise this! Trading Update – Comfortably in-line, average fee levels continue to increase, seeking FCA approval for a wholly owned subsidiary to broaden services. This was on my Watchlist back when it was half this price. Expectations are now very high here so I have decided to sit on the sidelines for now – Neutral. Final Results For The 12 Months To End May 2018 – Revenue up 53% (£16.5m), PBT up103% (£7.3m), Net Cash up 121% (£7.5m), EPS up 114% (14.1p) and the Dividend is up56% too (11.25p). New technologies and systems should fuel future growth, 2019 trading is ahead of expectations. A lot to like – Been on my Watchlist since it was half this price and it may be time to stop sitting on the side-lines. Subsequent note: After further analysis I reckon this is maybe over valued by 100% on a 1 year view (as EPS growth is negative) – I am Neutral here.